HISTORIC RAINFALL AND FLOODING HAS DISPLACED THOUSANDS OF PEOPLE IN NEPAL. Devastating monsoon rains and landslides have displaced thousands of people across southeastern Nepal. Hundreds of people have died since the rains began earlier last month. Samaritan’s Purse is on the ground to help those in desperate need. 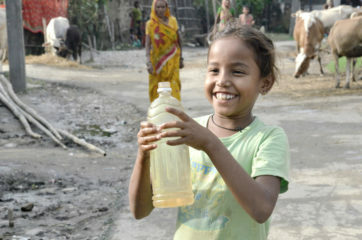 We are operating two water treatment kits that will provide clean water to families. Each unit filters about 38,000 litres of water daily, sufficient for 2,500 people. We have also distributed water purification tablets to more than 1,000 families. OUR TEAMS ARE PROVIDING CLEAN WATER TO CHILDREN AND FAMILIES IN NEED. To date, our teams have distributed non-food items and hygiene kits to more than 2,700 families and provided medical care to about 650 children and adults, in relief efforts that are ongoing. “Please pray for Nepal. 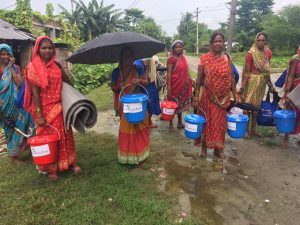 The flooding is the worst in the last 10-15 years and is affecting some of Nepal’s more heavily populated districts,” said Matt Cain, Samaritan’s Purse regional director. Flooding has occurred in at least 26 of Nepal’s 75 districts, and access to these areas is extremely difficult due to road closures. A disrupted transportation system also prevents Nepalis from travelling to hospitals or medical clinics. 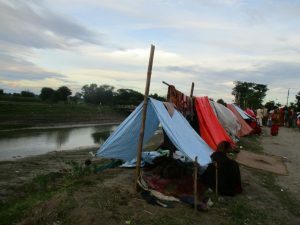 MANY FLOOD VICTIMS HAVE SET UP TENTS ALONG THE MAIN ROAD AFTER THEIR HOMES WERE WASHED AWAY. The heavy rains have destroyed rice crops in southern Nepal and killed a large number of livestock. Displaced families are living in temporary shelters and struggling to find dry, safe places to take refuge. Please pray for the people of Nepal. Pray for our staff as they meet physical needs and share God’s love with hurting people.